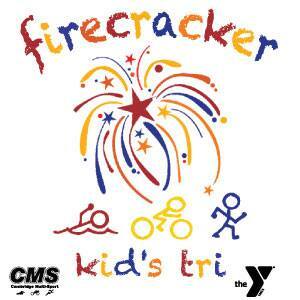 Thank you to everyone who came out and attended the 5th Annual Firecracker Kids Triathlon today at the Dorchester Family YMCA in Cambridge, MD. We’d like to, again, thank our sponsors, TriCycle and Run, A Different Drummer Farm, Yacht Maintenace Inc, Jim and Pam Laverty, Mullaney Insurance, Bay Pediatrics, St Michaels Running Festival, Rob Davis C.P.A., A Time to Heal Physical Therapy, Talbot Smokehouse, Tracey and Sam Maccherola, The Keene Family, and the Goodwin family, for their gracious donations! We would also like to thank the Dorchester Family YMCA for the use of their facility, James Laverty for being our DJ, William Jones for being our announcer, Bay County Bakery for providing food for our athletes and countless volunteers who, without them, this event could not have happened. Many of the parents are sharing their photos on the Firecracker Kids Tri Facebook page (https://www.facebook.com/FirecrackerKidsTri/) and we will try to get some of the photos up on the Cambridge MultiSport website (www.cambridgemultisport.com). The final results of the day can be found by following FirecrackerFinalResults. Congratulations to all of our age group winners. If you believe there is a discrepancy, please contact Race Director Jason Chance at tcreventmanagement@gmail.com. If you would like to see about us helping you put on your event, please contact us at any time.